The following data is new and fresh. There has been no time for proper analysis or deep study. It looks like newsstand sales are down -13.4%, and sell through looks to be down to 24.4%. As noted below this is a limited version of the data. It is worth noting that Hudson Atlas News is not included in these totals nor is Barnes & Nobel. There has been some discussion of the Mary Meeker 2017 data in this newsletter over the past few days, and this new Magnet data does seem to parallel that other data set. But that too is just a set of numbers. Some have said those numbers are biased. I put forth the proposition that all analysis no matter how innocently prepared is to a greater or lesser degree biased. You take what you understand and apply your own real time experience to it for meaningful comprehension. I have many times and continue to point out that this data and other charts are an aggregate of everyone and, although they might be interesting, averages contain both winners and losers. There has always been death and destruction in the magazine business. But there have also always been winners, and I believe we need to continue to focus on the winners. I take the position that at our peak of production in the early years of the 21st century, when our competitors were only TV and radio, we had reached a print position of irrational exuberance. We topped out because readers could/would support it. Now as we head into a more digital focused age of media distribution, it is harder, but surely not impossible, to justify an existence for print titles. The bar for success in print is now higher. The readership is now more refined and narrow. Niche enthusiast titles rule the roost and general mass market titles are fewer and fewer. Still, there is plenty of room for print titles and the paper that supports the process. The days of irrational exuberance in print are over, but we are reaching a point of cogent maturity for publishers, printers and paper manufacturers. Print will be around for quite some time, not as a commodity, but as a luxury item worth paying for. The only catch is that what is printed has to be worthy of the commercial exercise to produce it. BoSacks Speaks Out: Like many an industry pundit I wait with great anticipation for the annual Mary Meeker Internet Trends report. Today I plowed through all 355 slides. Yep, that's a lot of slides, but it's worth it for any futurist worth his or her weight in prognostications. Simon Dumenco doesn't even mention the slides I particularly found interesting, which is understandable given our different sections of the revenue tree. He writes for Ad Age and I write for.... well, the rest of us. Here are a few of the slides I culled from the group with a quick observation on each. See my next lecture, and I will go deep into explanations and discussions of the big picture. This is, of course, one of the most important charts out of all 355, at least from the perspective of magazine media. The good news, I guess, is that time spent with print did not go down this year. It was at 4% last year. 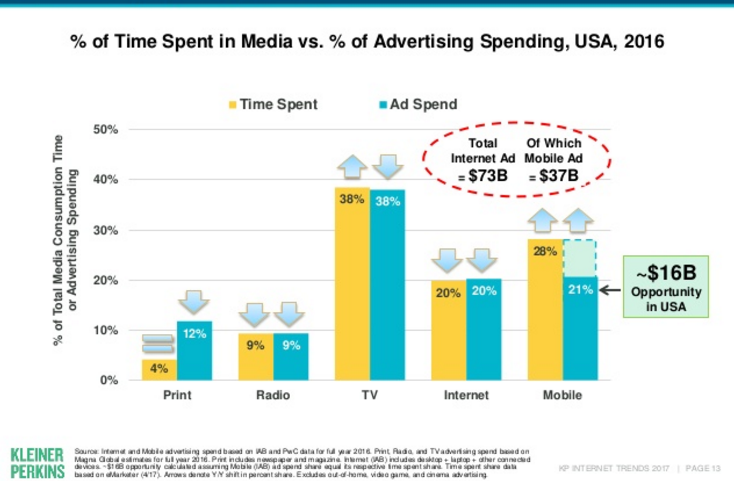 The non-surprise is that advertising in print continues to decline. Last year the report had ad print advertising at 16% of the total spend. There is no way to spin this as anything but a continuation of recent and long standing trends. There is no way to alter or avoid the facts. But as I discussed a few days ago, creative media entrepreneurs like those IMAG-MPA, CRMA and others continue to invent new revenue streams not indicated in this chart. Creativity is our only way towards revenue success. My friend Esther Kezia Thorpe, whom I met in a London rooftop pub a few years ago when she interviewed me, makes some interesting observations here. But I think the survival or death of Airbnb magazine will rise or fall like any other publication: on its excellence or the lack therein and of course the uniqueness of the information provided. There are unlimited travel information opportunities everywhere in print and on-line. What separates success from failure are the rarities and qualities of the information provided combined with the format that the information resides upon. Digital is relatively cheap to produce and to sustain, and it has the advantage of being accessible literally everywhere at any time. Even inferiorly produced printed products, which Airbnb won't be, are quite the opposite as they are relatively expensive to produce and distribute. So, the chance of survivability many times depends upon the expense to produce the product. Hearst is not known for half-way measures, so I expect that Airbnb with have both editorial and production excellence. That doesn't assure success, but it does offer a reasonable chance for one. There was a time, and it doesn't seem like it was that long ago, when no matter where your company was in the hierarchy of publishing, the most common denominator to the magazine franchise was that we all published printed magazines. That is no longer the case, and the magazine industry is almost unrecognizable from its past lifetimes. For 600 years we put thoughtful ink on paper and sold it to a willing public who were in the need to know. Now as we reallocate resources and streams of income, print, although it is still about 75% on average of the revenue pie, gets little of the conversation and only a small amount of the love. This reaction comes from just attending the IMAG-MPA conference in Los Angles. It was a great show filled with important media conversations, and I highly recommend you go if and when you can. It seemed to me without looking at my notes, that at this event 90% of the conversation was about video. This is clearly what everyone expects to be the next big thing when it comes to new revenue streams. I personally have my doubts. Will it be a thing? Absolutely! But THE thing? I am not so sure. BoSacks Speaks Out: Print media is growing; will print advertising follow? As my long-time readers know I have a global interest in regards to the information distribution business formally known as publishing. The following article is obviously from India, but some of the dialog from India could be heard at any domestic media conference. And that is the point of sending this type of article out. Media with its multitude of nuances is global. One way or another every information distributor faces similar obstacles and successes. Keeping a world view on publishing helps me see trends that I might otherwise miss. Speaking of missing a "print is not dying" moment, last week I sent out an article titled As Print Continues to Die, Why are Conde Nast and Hearst Launching New Magazines. That article discussed among other titles that Penthouse did away with its print edition. Both my favorite newsstand consultant and Kelly Holland, the CEO Owner of Penthouse Global Media, immediately contacted me with the correction that Penthouse is still on the newsstands and according to Kelly, "We are expanding from 10 issues annual to 12." Kelly and I had a conference call today where she briefly brought me up to speed with how they are working and revitalizing this classic brand. I didn't hear anything that couldn't work. Adult titles are one of many niche publishing areas of focus. As I suggested to Kelly, "It all sounds reasonable. The trick in any company or any niche is execution of the business plan." The caveat, of course, is that proper execution and a fair amount of luck is no easy task, but both are accomplished every day. That, of course, doesn't condemn everybody. But there are too many examples of profit above truth to deny a strong resemblance that the accusation exists here and there. Women's magazines in particular have for a hundred years or more, fed on the needs and promoted unrealistic expectations on a very vulnerable public for a nice profit. Take Doctor Oz for example. He has a very successful magazine. He is, as reported in Wikipedia, "a proponent of alternative medicine and has been criticized by physicians, government officials and publications, including Popular Science and The New Yorker, for giving non-scientific advice. In a Senate hearing on weight loss scams, Senator Claire McCaskill chided Oz, saying, 'The scientific community is almost monolithic against you in terms of the efficacy of the three products you call miracles.' An investigation by the British Medical Journal found that 46% of his claims were misleading or incorrect." Yet Doctor Oz has a very successful magazine. I've been told that the good doctor's magazine "The Good Life" has editorial content that is free of any miracle medical cures. That is fine, but it is not free from the mascot protagonist about whom it has been stated that "46% of his claims were misleading or incorrect." It's not free from a spokesperson that faced an angry congress "for giving non-scientific advice." The Goldmine distribution story is a great lesson for every publisher and gives me some fond memories of publishing times past. My first two publications, one in New York called "The Express" and one in Arizona, called "The Mountain NewsReal" were from a media species then called the underground press. I was in my early twenties and we had no rule books or mentors, so my partners and I just made up "procedures" as we went along. One of the things we explored was not only publishing an alternative newspaper but also alternative distribution. Our papers were distributed not on newsstands, but in retail outlets, hair cutters, bars, clubs, college dormitories, rock concerts, head shops, and a dozen other non-traditional publication outlets. The same theories held true later for us at "High Times" magazine. In the beginning no wholesaler would distribute the controversial title, so we needed to create alternative distribution outlets other than traditional newsstand. We did so to great effect and extremely high sell through numbers. It is the non-traditional aspect of this story that modern publishers should consider. The old newsstand outlets are diminishing, with rare exception. Each sales report is down by double digits from the year before. It seems to me that creative new distribution outlets like the ones that Goldmine found are the way to offset some of the lost circulation. I know that many niche titles today do this very thing; they distribute their publications where their readers are rather then where their readers aren't.